After baby number 4 I became even more determined to work on my core. I exercised daily during pregnancy and had great plans to continue this practice after baby came. Surely she would sleep and allow this mama right here to exercise? HAHAHAHAHA! How quickly had I forgotten what it is like to have a newborn! So priorities need to change in this newest season in my life. I had been stressing out about losing weight, eating healthy, what exercises to do…I can’t think! I am a physical therapist that works with women! Why can I not process how to care for MYSELF!? I was causing myself unneeded stress that was essentially preventing me from recovering and from focusing on how to heal. Stress has a miserable impact on the health of a new mama. Making time for self care needs to become a priority in her life. How is this possible with a new born and all the other endless responsibilities of being a mom? Let’s take a moment to refocus and circle back around to this topic. Have you heard of the practice of being mindful? 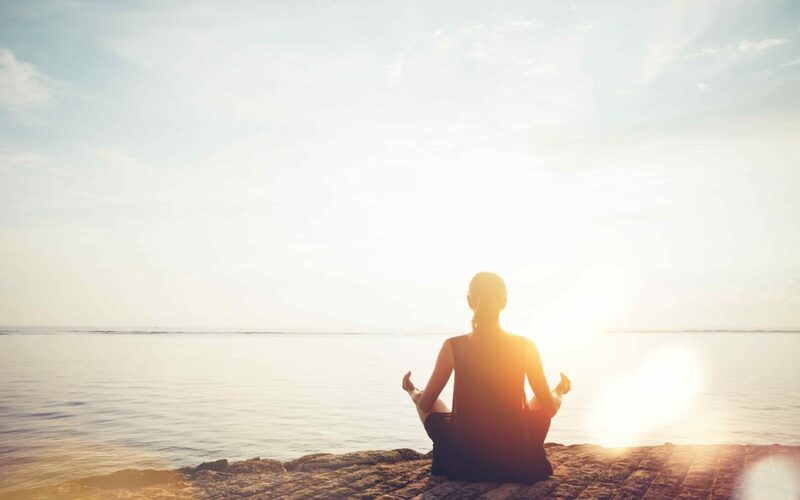 Mindfulness is the act of an individual to remain “purposefully and nonjudgmentally attentive to their own experience, thoughts, and feelings.” 1Epstein RM. Mindful practice. JAMA. 1999; 282(9):833-839. Mindfulness practice aides in reducing reactiveness and strengthening ones response to stress. 2Beach, M. C., Roter, D., Korthuis, P. T., Epstein, R. M., Sharp, V., Ratanawongsa, N., Cohn, J., Eggly, S., Sankar, A., Moore, R. Saha, S. A Multicenter Study of Physician Mindfulness and Health Care Quality. The Annals of Family Medicine. 2013; 11(5), 421-428. Mindfulness-based cognitive therapy has shown a significant benefit for individuals with a diagnosis of depression. 3Strauss, C., Cavanagh, K., Olivar, A., Pettman, D., Mindfulness-based interventions for people diagnosed with a current episode of an anxiety or depressive disorder: a meta-analysis of randomized controlled trials. PLoS One. 2014; 9(4):e96110. Mindfulness meditation combined with nutrition and exercise is called resilience training. In a study performed on depressed healthcare professionals, resilience training caused a 63-70% reduction in stress, as well as decreases in stress and anxiety. 4Johnson, J., Emmons, H., Rivard, R., Griffin, K., Dusek, J., Resilience Training: A Pilot Study of a Mindfulness-Based Program With Depressed Healthcare Professionals. Explore. 2015; 11(6) 433-444. Being mindful requires time and practice and is one of the first steps to bringing healing to yourself. Pause. Take a slow deep breath in for 5 seconds, then take a slow deep breath out for 8-10 seconds. Repeat this sequence 5 times before reading this article. Now continue to pay attention to the breath. As you breathe notice any releasing or tensing in your belly. Breathe again and notice any releasing or tensing in your pelvic floor. If you mind wanders just gently bring it back to your breath. This simple mindful breathing technique is a step towards greater awareness of your core. I would like to explain to you why this process occurs and also why it may be difficult to sense. I will also walk you through a gentle exercise to help bring more awareness to your mama core. During unconscious inhale the breathing diaphragm descends to allow for air to enter into the lungs. As it descends the pressure created causes the abdomen, back musculature, and pelvic floor to expand. The opposite holds true during exhalation. As you exhale the diaphragm elevates, the transverse abdominis and back musculature engage, and the pelvic floor lifts. The beauty of these core muscles working together creates a harmony that is vital to health. Any stress to these structures can change the dynamics of breath. Pregnancy, breath holding, emotional stress, poor diet, and or lack of sleep can have a powerful impact on the function of this core harmony. I would like you to try this exercise lying down on your back. You may support your head on a small pillow. You may also place a pillow under your knees. Close you eyes and practice the mindful breathing technique 5 times. Scan your body and bring awareness to your breath, to your core. Sense the harmony in these structures. As you breath in you want to sense a releasing of the belly and pelvic floor. As you breath out you want to feel a sense of tension in the belly and pelvic floor. This technique may be very difficult for you to feel and will take practice over the next several days to develop the mind body connection. As you practice your brain will make tiny connections and will help you become more aware of your breath and its affect on your core. If you experience pain during these exercises, or you are unable to connect to your core unit, then please stop the exercises and visit a women’s health physical therapist to have hands on techniques to restoring your core unit. I also strongly encourage you to visit a women’s health physical therapist 6-8 weeks after having baby and after you have been cleared by your physician or midwife for exercise. Do you feel more relaxed after these exercises? If you are feeling stressed focus on breathing in and out calmly for a few min. The process of reconnecting your post natal body takes times. Remember to always give yourself grace! You are in a new season of life that requires time and patience with yourself as well as your new baby. These exercises are safe to do right after having baby. Try to find one time in your day to just mindfully bring attention to the breath. I do mindful breathing as I wake up in the morning and as I fall asleep at night. Breathing and connecting with your body mindfully will have an amazing impact on your healing. Breathing causes circulation of blood flow throughout your body which positively impacts your ability to heal your mama core. 1. ⇧ Epstein RM. Mindful practice. JAMA. 1999; 282(9):833-839. 2. ⇧ Beach, M. C., Roter, D., Korthuis, P. T., Epstein, R. M., Sharp, V., Ratanawongsa, N., Cohn, J., Eggly, S., Sankar, A., Moore, R. Saha, S. A Multicenter Study of Physician Mindfulness and Health Care Quality. The Annals of Family Medicine. 2013; 11(5), 421-428. 3. ⇧ Strauss, C., Cavanagh, K., Olivar, A., Pettman, D., Mindfulness-based interventions for people diagnosed with a current episode of an anxiety or depressive disorder: a meta-analysis of randomized controlled trials. PLoS One. 2014; 9(4):e96110. 4. ⇧ Johnson, J., Emmons, H., Rivard, R., Griffin, K., Dusek, J., Resilience Training: A Pilot Study of a Mindfulness-Based Program With Depressed Healthcare Professionals. Explore. 2015; 11(6) 433-444.